Жаль, что шкуродерни и распоры плохо сочетаются с фотоаппаратами. Во второй день я бы с огромным удовольствием поснимала бы кристаллы. Красота непередаваемая! Такое нельзя увидеть нигде: только в пещере. 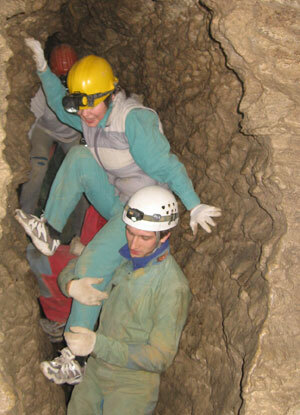 It was my first speleological trip. All new sports helps me to open one’s mind. This is not exception. I understood that we have a lot of space in daily life:) And I understood that all, what I do helps me: bicycle trips gives me strength of muscles, ballet – good flexibility, ice-skating – hardiness and tourism gives me strong optimism in any situation. Leader of our group was Alexey Pinchuk. He was my client in bicycle tour in India. He is very good speleologist. He knows this cave very good and he know what he should do with beginners in hard situation. 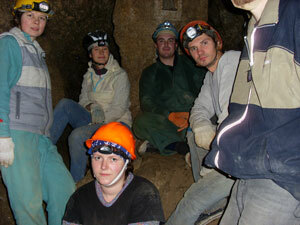 I think that I have so good impression about speleology owing to the fact that first trip was with Alexey as leader. Unfortunately, I can’t take my camera in cave, because there a lot of “skinning passage”. In that cave so amazing crystals! Different colors, size and form… It is very beautiful cave. P.S.Thank a lot to Alexey Pinchuk for invitation in this trip, for all help and fore more open my mind. Возле памятника спелеологу в глубине пещеры. Part of group near monument of speleologist in hurt of cave. Так помогали проходить распоры тем, у кого уже сдали нервы. Часть нашей группы после прохождения распор. Part of group in thrust.